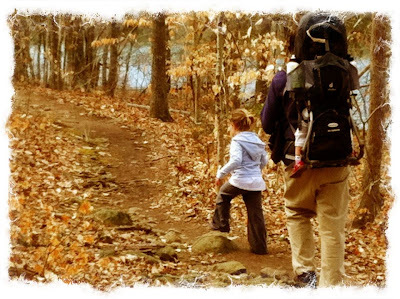 We are a family living with severe food allergies and telling our stories. We seek normalcy, but we demand safety. I have big news! My blog has officially moved. This will undoubtedly be my last post ever at this site, unless it’s not. All of my baggage is packed and ready to be unloaded at the new blog site. Let me just say, I have a LOT of baggage. Come and read all about it at allergenmenumom.com. See how easy that is to remember? I’m excited to get rid of the extra stuff in the web address. Purging is one of the biggest perks of moving. What are the drawbacks of moving? Well, the biggest is that people suddenly have an old address for you on their holiday card list, so you just get left out. Don’t forget to subscribe to the new blog so you will get updates. I will be posting a doozy later today that you won’t want to miss. Look for the post “Shame On Me” shortly. Again, it’s allergenmenumom.com. Come on over and stay awhile!!! 1) Mince garlic (I only had potted garlic on hand, so it was already minced) and dice onion and bell pepper. 2) Coat large sauce pan with olive oil and saute garlic on medium heat. Add onions and peppers to the pan and saute until the onions are translucent. 3) Add sauce and herbs to the pan and simmer 15 minutes. 4) While sauce is simmering, shred the cheese and slice zucchini into long thin strips. I shoot for about ¼ inch thickness or less for the zucchini strips. 5) Spray Lasagna pan with cooking spray and begin layering. 6) First, spread a thin layer of sauce over the bottom of your dish. Then, add a layer of lasagna noodles (uncooked). Don’t worry. There will be plenty of liquid from the sauce and vegetables to cook the pasta. I used a sparse layer of pepperoni on top of the pasta. Then add a full layer of zucchini strips, followed by a sparse layer of shredded cheese. Use about ¼ of your cheese per internal layer, leaving about ½ for the top of the lasagna. After the cheese, repeat all layers one more time. 7) Top with one final layer of sauce, then sprinkle remaining ½ of shredded cheese over the top. *Busy Mom tip: If I have leftover sauce, I like to make a smaller version with whatever else I have left. This time I had sauce, pasta, and zucchini left, so I just layered them in a small dish to bake along side of my lasagna. I will pop it in the freezer after it cools and reheat for a quick lunch for myself or the kids when I need it. 8) Cover lasagna pan with foil and bake for 45 minutes at 375 degrees. Uncover and cook an additional 15 minutes or until cheese begins to brown. I like to turn the broiler on low to make sure the cheese browns at the end, but be sure to watch it closely if you do this. This was the first lasagna our girls had ever had and they both loved it (ages 4 and 22 months). My husband is not usually a huge fan of zucchini, but the pepperoni was enough to win him over. Our family works with severe egg, dairy, peanut, and tree nut allergies. I use products and brands that I am comfortable with based on a combination of labeling, prior experience, and recommendations from others with similar restrictions. I do not regularly call the company for factory information on all brands we use. Please use brands and ingredients that you are comfortable with based on precautions you typically take . New Recipe for Cinco De Mayo!!! Heat olive oil in a skillet over med heat. 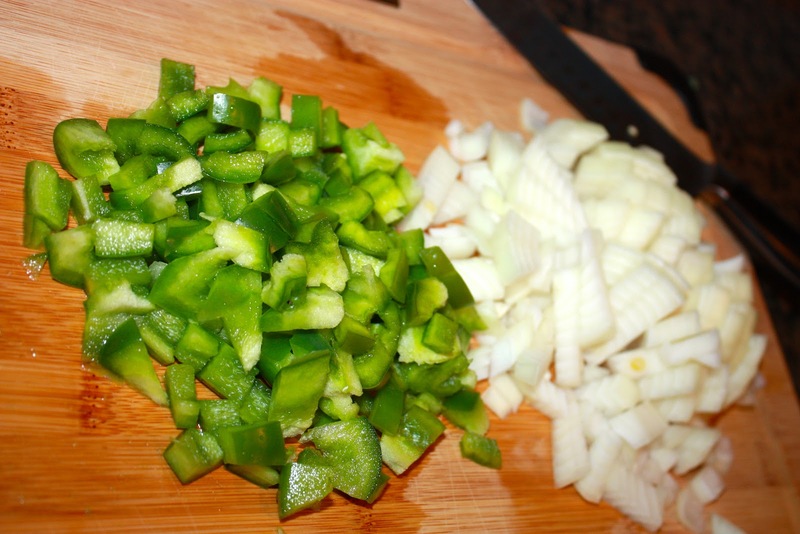 Chop onion and dice jalapeno (remove seeds if you're a wimp like me). Remember to reserve ½ of the jalapeno for your fresh avocado salsa. Add onion and diced jalapeno to oil and saute until onion becomes translucent. Add ground turkey to the pan and cook, breaking apart, until meat is just brown. Turn heat to low. Drain and rinse beans. Add beans, chili powder, cumin, oregano, and thyme to the pan and stir. If mixture seems dry, add a few tablespoons of water. Allow to simmer on low for a few minutes before assembling tacos. Spoon desired amount of turkey/bean mixture, fresh salsa (recipe below), and shredded lettuce into tortillas. Chop tomatoes, onion, and avocado and add to a medium bowl with diced jalapeno. Mince garlic and add to mixture. Chop cilantro and add to bowl. Mix all ingredients together gently so the avocado stays in chunks. Add salt and cilantro and stir gently. Your salsa is ready for tacos or for scooping onto tortilla chips. Double batches are never a mistake!!! Chick-fil-A is one of the most controversial kid spots among food allergy parents we have encountered. Some are adamantly against setting foot inside the door, while others insist that there is no risk of a reaction. The real issue is whether or not 100% refined peanut oil poses a threat to those who are allergic to peanuts. In a nutshell (pun intended) the debate is as follows. Allergic reactions are caused by food proteins. The process of refining peanut oil is said to remove all peanut proteins, leaving a product that is very different from peanuts or peanut butter, from an allergy perspective. Some trust the process, while others remain skeptical that the process could be completely flawless, yielding a hypo-allergenic refined peanut oil. Here is how Chick-fil-A addresses the controversy... http://www.chick-fil-a.com/Food/Ingredients-Peanut-Oil . For us, Chick-fil-A has always been a sore spot. We have subscribed to the “don’t set foot in the door” camp since Elena was diagnosed in September of 2009. Being anaphylactic to egg and dairy, as well as all nuts didn’t help our comfort level. Considering the fact that their nuggets and chicken strips contain both dairy and egg ingredients and their buns are processed on shared equipment with milk, we would pretty much be left with a fruit cup. It was an easy stance to take. After all, who is going to take even the slightest risk just to take your child into a place where other kids are enjoying mounds of delicious looking nuggets with all sorts of wonderful dipping sauces, fries, ice cream cones, etc., and all they can have is a fruit cup? Not us. The tables were turned for us with two recent changes. We can only assume that someone put a bug in that cow’s ear. Chick-fil-A made the switch from peanut oil to canola oil for their fries. Mind you, this switch was only for fries. The chicken, which contains our other allergens anyway, is still cooked in peanut oil. But now, the fries are safe. Suddenly we are at fries and a fruit cup. Hmmmmmmmmm. Next, Chick-fil-A came out with their grilled nuggets. We knew these had potential to be safe. After I emailed the company and received allergen information on the new grilled nuggets, we turned a corner. We now have fruit cup, fries, grilled nuggets, and let’s not forget polynesian sauce for dipping. Yes folks, that’s a full meal. A couple of weeks ago, we ventured into Chick-fil-A for the first time with our 3 ½ year old. She ate, she dipped, she played. She talked about it for days as if she had been to Disney World. She since has been a handful of times and every experience has been wonderful. She gets the grilled nuggets kids meal with fruit and apple juice. We haven’t done the fries yet, but I’m not afraid of them. “I’m afraid of fries” seems like a funny thing to say to most people, but I know you other food allergy parents feel me. Chick-fil-A is almost a rite of passage for kids in our region. It is a special treat, a reward for good behavior, a place to play and eat, a play-date spot, a daddy daughter date night destination, and for us, it is now an option. It’s so amazing to add even one food option to your list when you have a child with life threatening food allergies. Also, people start to recognize you. After several visits, we quickly became known as the grilled nugget family. We all get grilled nuggets and try to keep our table as safe as possible. Among us, there are probably 30 grilled nuggets at the table and fruit cups galore. What a blessing to be able to experience this rite of passage with our little girl. Cunningham family, you have successfully added Chick-fil-A to your safe dining repertoire. What are you going to do next? We’re going to Disney World!!!!! Seriously, we’re going to Disney World next week. Check back soon for some truly magical blogging from the happiest place on earth. Well, the time has come to have our youngest, Olivia, tested for food allergies. I have suspected an egg allergy for a while, but it’s so hard to trust my emotionally charged observations. Olivia does have occasional minor flare ups of eczema, but not as bad as Elena did. I have suspected egg would give her trouble based on reactions I have seen after eating egg myself, then nursing. It’s always hard to tell exactly what is going on with any baby, though. A diaper rash can be caused by any one of about 30 things, a runny nose can mean they are sick or not, spit up happens with and without explanations, and teething can look like anything else under the sun. How can I be sure any symptom was caused by the egg I ate? It’s easy to hold on to little rays of hope, but also scary to go into an assessment clinging too tightly to that hope. This is a photo of Olivia about 6 hours after I ate egg. Her cheeks became red and she got some small bumps on her face. We decided to go ahead and have Olivia tested for the top 8 food allergens and goat’s milk (thinking ahead to her first birthday transition). We did not have any solid evidence, but living in a house that is free of egg, dairy, peanuts, and tree nuts and not ever eating fish or shellfish due to age doesn’t give a lot of opportunity for exposure. We wanted to know what precautions are necessary for Olivia, rather than just imposing on her the same ones we use for her sister and hoping for the best. 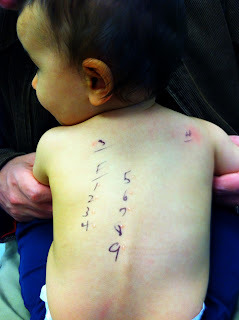 We went in for the testing and our allergist decided to go with the skin test rather than the blood test. Whew!!! Seeing as how the blood test we did on Elena at 9 months was one of the most horrific experiences I remember, I was glad to hear this. Olivia did very well and, although her little body jerked with each of the 11 pricks on her back, she never made so much as a whimper. Actually, I should not say never. She screamed hysterically when they were weighing her, but who can blame her for that? I can relate. We are so thrilled and so pleasantly surprised. I’m ecstatic that we won’t have to worry about Olivia touching, eating, reacting to the foods in her environment. I can’t help but feel sad for Elena, though. She has lost her teammate. She had already begun talking about how she and Olivia could not eat certain things and they were just alike. They are alike in a lot of ways, which I tried to point out to her after the appointment, but not in this way. Ultimately, Elena decided she is glad she doesn’t have to worry about her sister’s food like she has to worry about her own, but I’m sure this is something she will struggle with. I can’t imagine how lonely she must feel in all of this. To add insult to injury, Olivia will be bringing her food into Elena’s safe haven. The allergist told us that it is best to introduce all of the top 8 and give them frequently, now that we know Olivia isn’t allergic to any of them. He said that by introducing them and then waiting months in between exposures, we would actually be increasing the chances that she would develop an allergy. I suggested not giving them to her at all, but the idea did not seem to be in Olivia’s best interest. I guess I knew it before I asked, but I had to ask. Now that I know the extent to which food allergies interrupt and limit Elena’s experiences (not just with eating), I can’t impose the same restrictions on Olivia unnecessarily. If it were just the food, that would be doable, but as you all know, it’s so much more. I am worried that Elena will resent her sister or that people will prefer Olivia’s company to Elena’s because of the ease. I also worry that Elena will begin to feel excluded and less safe in her own home. I recently read a blog post where a mother described the constant battle of evening the score between her children due to experiences, treats, and privileges involving food. It seemed like a full time job. I know this is the lesser of two evils and I am so thankful for these results. It’s time to learn a new dance and I’m sure my girls will help me figure it out as we go. For now, I just want to celebrate these results. I need to celebrate Olivia and all of the possibilities that have been opened to her today. She will never have to struggle with being hungry and not being able to figure out if the food she has available to her will do anything more than ease her hunger. She will never have to fear parties and celebrations because of the food that will be present. She will be able to visit friends without having to establish a plan of action for meals and snacks ahead of time. She will not have to know the feeling of having an Epipen pouch accompany her everytime she leaves the house or the panic that comes with forgetting it. My Olivia can be fully engaged in life without having to sidestep social situations because of food. She will be able to appreciate all of these things fully because she will know the alternative better than most, as she will be playing her own role in helping to keep her big sister safe. Elena shares her thoughts on Olivia's test results. I just want to take the time to thank all of the people in our lives who have gone out of their way to participate in our battle against food allergies. By this, I mean, those who have put themselves in our shoes and taken special consideration to reduce Elena’s risk of exposure and exclusion. First, what does this mean? Exposure and exclusion are the two things we fight against the most. Obviously, we go to extremes to ensure that Elena will not come in contact with any food containing one of her allergens each and every day. The other struggle we face daily is fighting to avoid exclusion due to Elena’s allergies. Every time a new and unfamiliar situation arises, my first inclination is to avoid attending. I never know what the food will be like and how I will make Elena feel included in the event if she is not able to enjoy the treats that every other child around her is having. We have so many friends and family members who have thought about this for us in advance and made sure Elena would be included. We are so lucky to have such caring and considerate people in our lives and I think they can serve as a great example to other people who have friends dealing with food allergies. I’m going to avoid using names because so many people have done these things for us and I don’t want to leave anyone out. The acts are pretty amazing and all unsolicited. I don’t even think I would have been able to think of these kind acts myself and I am amazed at how thoughtful these people have been. One of the most dreaded events for many kids with food allergies (or their parents anyway) is the birthday party. With our allergies (egg, dairy, nuts) cake is always an issue. I always plan to bring Elena her own safe cupcake, but sometimes it’s just not the same. All of the kids are crowded around a beautifully decorated cake unlike any they have ever seen, while Elena is at a safe distance with her same old cupcake that she gets every time there is a celebration. Sure, I try to change it up. I do different flavors and decorations. Sometimes I let her decorate it herself, which is great fun while we’re at home, but when faced with the magnificence of the treat being enjoyed by the other kids, hers always seems to be a bit of a disappointment simply because it’s different. Elena has actually woken up in the night crying because she dreamed she was at a birthday party and couldn’t have a cupcake like the other kids. It is heartbreaking to see anxiety beginning in your 3 year old. Although I fear exposure AND exclusion, she only fears exclusion. I have no doubt that the fear of what could happen if she is exposed to an allergen will come in time, but for now she does not have an understanding of these risks. 2. Finding an allergy safe bakery and ordering a special treat that Elena did not have to bring herself. She loves getting something she has never seen before and that she knows Mommy did not bring. 3. Making safe cupcakes/cake. Yes, actually making egg/dairy/nut free dessert for EVERYONE!!! Can you say, amazing? Elena, being the only one with a food allergy in attendance did not even know the magnitude of this act, but I sure did. 4. Letting me know ahead of time exactly what foods/treats will be served so I can duplicate as closely as possible. This makes such a difference because, although hers is different, it’s not SO different. This is Uncle Scott's 32nd birthday cake with princess sprinkles. Tiffany proves you are never too old to have an allergy free birthday cake, even if you don't have food allergies of your own. You're welcome for this photo, Tiff. Elena's 2nd birthday party. All of the kids enjoyed this allergy free cake even though Elena was the only one there with food allergies. This was Elena's 1st birthday cake. She had her own safe smash cake and this one was NOT safe. Yes, there was a time when I questioned whether I had the right to serve allergy free food to other people. I am so glad those days are over. Birthday parties are not the only difficult situations for a family dealing with food allergies. It is also extremely difficult to accept help from others when we need it. For example, when our second baby was born, we had to decide whether or not we could accept meals. Ultimately, we decided that we would accept meals, but not allow Elena to have them, which meant cooking for her even when a meal was being provided for the rest of us. So many people offered to bring safe food, but the truth is, we didn’t feel that we could accurately convey what goes into ensuring that a meal is safe, nor could we ask people to take such precautions. Those friends of mine, what do you think they did? 1. One gave me a detailed list of everything she was making ahead of time, including brand names and ingredients. She actually did this for several options and asked me to choose one. It was incredible!!! 2. Someone removed all labels from the ingredients she used in her dish and taped them to one big piece of paper so I would have them in front of me. Of course, she checked first as well, but this way I could read them for myself. 3. One person took photos of all labels with her phone and brought it to me to scroll through before letting Elena eat. I knew every ingredient was safe. 4. Some ordered take out from a place we trust and gave the manager the shake down to make sure they got it right. Finally, we feel the love by how we are treated in our own home and at our own parties. I tend to host parties and play dates whenever I get a chance so that I know Elena will be able to celebrate holidays and events safely. When we have people over, all of our food is allergy free. We do not have anything at our party that Elena cannot enjoy. This makes for some food options that are a bit out of the ordinary for many kids. Kids who are used to goldfish, cheesy foods, creamy veggie dips, and other “kid food” are faced with veggie/hummus platters, vegan cupcakes, and whatever other festive Pinterest party food I have modified. Do you know how many complaints I have heard when the kiddos see the food table? None. I have never ever heard anything negative about our less than customary spread. Even more amazing, the adults are open as well. You might not think it, but adults are far more difficult to please than kids when you mess with “traditional” food options. I have heard grown ups turn up their noses at specialty diet foods more often than I care to remember. I have even seen family members of another allergic child refuse to eat his birthday cupcakes because they were allergy free. I had a difficult time picking my jaw up off the floor on that one. Thank you to all of our wonderful people for being on our side of this battle. I cannot even begin to express what it means to us. You have changed our lives for the better!!! We went through about 10 different versions of these before we got it just right. Now we can't get enough of them. They are easy and delicious. This is my first time writing a recipe, so please leave feedback. Let me know if any part is unclear or if you have questions or suggestions. These are egg, dairy, peanut, and tree nut free (per our allergies). 1) Preheat your oven to 375. 2) Place the raisins in a dish and just cover with rice milk. Set them aside to soak. 3) Mix sugar and cinnamon. We do this by putting them together in a small container or baggie and shaking. this is a great way for kids to help. 4) Sprinkle clean dry surface with flour. Unroll one tube of crescent dough and lay flat on floured surface. Press seems together with fingers to seal. Sprinkle a light dusting of flour over the dough sheet and roll (length-wise) with a rolling pin until sheet is smooth and seems appear closed. 5) Spread 1/4 cup (half stick) of dairy free butter onto dough sheet. Sprinkle about 2 tbsp. of cinnamon sugar mixture on top of butter. Remove half of raisins from milk and sprinkle on top. Press raisins into dough slightly. Do not press too hard or you might have trouble rolling the dough in the next step. 6) Roll the dough in the direction that produces the longest result. Set rolled dough aside and repeat steps 4 and 5 with second tube of dough (Save milk from raisin soaking for use in the glaze). Lay the first rolled dough sheet on top of the second and roll together so you have one large log. 7) With a very sharp or serrated knife, slice rolled dough into 12 equal slices (about 1 inch thick) and place on baking sheet. Bake for 12-15 minutes. 8) While rolls are baking, you will make the glaze. Measure 1 cup of powdered sugar into a measuring cup with a spout (makes for easy pouring onto warm cinnamon rolls). Mix 2 1/2 tbsp. of rice milk (from reserve of raisin soaking milk) into powdered sugar. Add flavoring of your choice. If glaze is too thick, add a bit more rice milk. If too thin, add more powdered sugar. 9) Remove rolls from the oven and pour glaze over top. Enjoy!!! I am the mother of two beautiful girls, one of whom has multiple severe food allergies. Living with food allergies affects everything we do. Our daughter is not the only one living with food allergies. We're in this as a family.